There has been a recent renewed interest in all sorts of wave-riding vehicles, including the Paipo boards. 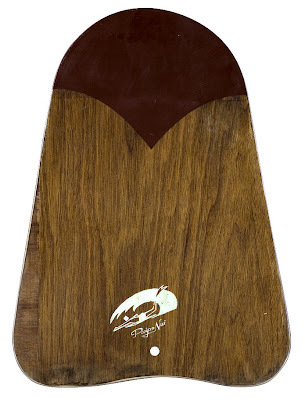 Circa 1960s, wooden board designed by and belonging to Val Valentine and donated by Tom Holbrook (as well as a Greg Noll transition era kick-nose board, and a Paddleboard that belonged to legendary waterman, Tommy Zahn). Val Valentine was a surf pioneer, lived in Hawaii, and made and rode Paipo boards (which he featured in his surf movies. Val's Reef on the North Shore of Oahu, was named after him). For a selection of images of all manner of belly, body, and kneeboards with descriptions, click this link. Richard Kenvin's upcoming "Hydrodynamica" also contains some modern day Paipo riding. Beatiful Paipo! It's a great day and time when people realize old school ways are just as good if not better than all the tech they put in these surf boards nowadays. It it was good enough then for watermen, why not now? Kudos and keep history alive! Much mahalo! !